Forget tablets. While I had been debating Android versus iPad for a while as to what tech "toy" to pick up next (yes, I have a Kindle Fire, a Samsung Galaxy S2 Skyrocket Android phone, and an iPad 3 for the family, but there's always another toy you can buy), I really came to a conclusion not too long ago that none of those make a sufficient laptop or computer replacement (particularly in terms of writing capabilities, etc. ), and that if I were to head down a "PC replacement" path, I might start saving my pennies for an Ultrabook. That said, there's still a market for "web toys" where I classify all of the tablets, etc., so I still may want to have something to play with. But Google has now made the decision for me. Forget 10 inch versus 7 inch. Forget Android vs. iOS (well, don't forget it because Android's going to win here). 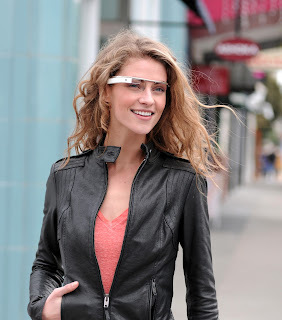 Google Glass has changed the entire game with a completely different device footprint altogether. With a tiny eyes up display, you can augment your world with the web. OK, maybe not entirely, but that's the concept. Overlay information on reality. It's all futuristic. With development pre-versions selling for $1500 next year, it will be a while before I grab this little toy, but I definitely want one - wave of the future, wave of the future. Check out this video that Google released to demonstrate (and potentially oversell, but we will see) the capabilities. And then this video from Google I/O just shows some of the capabilities from a video capture format. Enjoy!